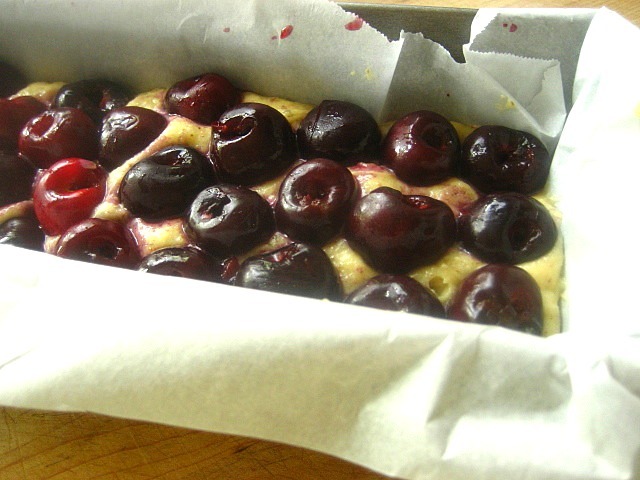 Cherry season is almost over, so hurry up and get some cherries so you can make this cake! 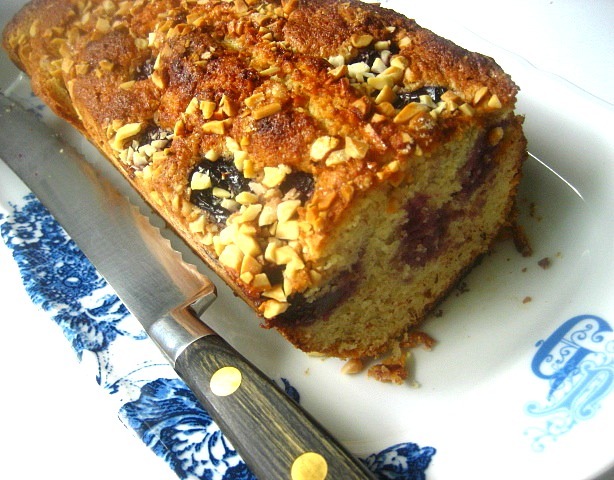 Eileen reminded me about this wonderful loaf cake from Deborah Madison's book Local Flavors. I found some nice Washington State cherries at Whole Foods so I got in under the bell. I love loaf cakes, they are easy to bake and I like to have a slice for my after school snack with coffee. Cherries and almonds belong together. Preheat oven to 350F. Butter a 9-inch springform pan or 9" loaf pan and line bottom with parchment paper. 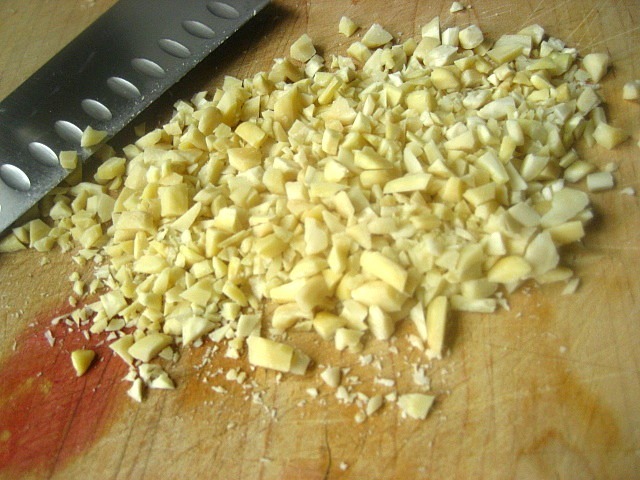 In a food processor, coarsely chop almonds. Transfer 1/4 cup of the almonds to a bowl and reserve. Add flour, baking powder and salt to food processor. Process until remaining almonds are finely ground. Transfer to a bowl. In a food processor, cream butter with cup granulated sugar. Add eggs one at a time, blending each one fully. Add almond and vanilla extracts. Add half of flour mixture and pulse to blend. Add remaining flour mixture. Pulse until smooth. 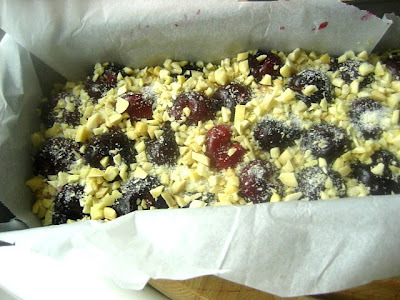 Scrape into prepared pan and place cherries on top in a single layer. Mix reserved almonds with 1 teaspoon granulated sugar and sprinkle around edge of cake. I had extra nuts, so I sprinkled them over the top of the cherries too. Bake until a tester inserted in center comes out clean, if using a springform pan about 45 minutes, and if baking in a loaf pan about 55 minutes to an hour (cover with foil if the top is getting too brown). Let cool in pan for 10 minutes. Unmold and let cool completely on a wire rack. Transfer to a cake plate. Dust edge with confectioners' sugar if desired. 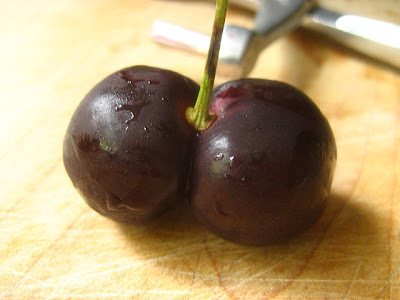 Cherries are one of my favorite fruits. I wish they would grow down here in the South. We still have tons of cherries here in the Northwest....will be making this over the weekend! I love Local Flavors book, it's great. I was finally getting over my constant cherry cravings and now...right back where I started. In the ingredient list, you show 1 cup of sugar, but in the instructions, you show 3/4 cup sugar, and nowhere can I find the remaining 1/4 cup being used. I seldom use the total amount of sugar listed in most recipes, because I don't think it's necessary, but I thought you might want to edit your recipe and make the correction. The cake looks great ~ I just hope I can still get cherries at my local. Thank you for sharing all your wonderful recipes and fabulous photos! 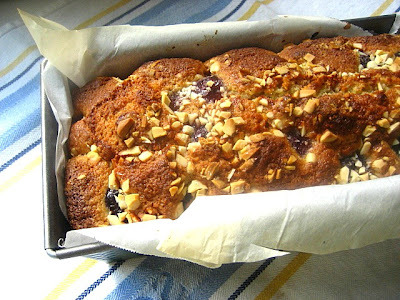 Cherries and almonds do indeed belong together, great recipe! I usually change or adapt some recipes to my own liking. The original recipe calls for 3/4 cup sugar, but I found it needed 1 cup of sugar, and I promise it's not sweet at all, so don't worry about the extra 1/4 cup. I usually adapt recipes and write in parenthesis ("adapted from the source"). This looks dreamy! 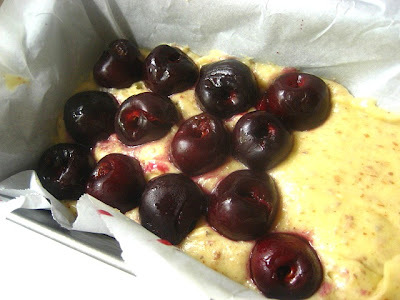 I love how some of the cherries migrated down into the dough (or were captured and pulled down ;-) I am definitely bookmarking this (might switch in some whole wheat flour)...looks so yummy! Ok, so maybe I'll break down and pit some cherries, this looks mighty good with the almonds! Just made two of them for tomorrow's celebrations. The cherries were ripe, the tea cake is perfect! And my kitchen is Nirvana. I'm still confused... you say the original recipe called for 3/4 cup sugar but you found it needed 1 cup sugar, yet your instructions say you only used the original 3/4 cup sugar. I noticed you didn't make the correction in the 'instructions', so I've decided to use 3/4 cup and call it a day. Enjoy the weekend! As you can see, I am a lousy recipe writer, I guess there will be no cookbook in site.....but I do have an editor! I changed it to the 1 cup that I preferred in the recipe. I don't think it matters, either way. Thanks for bringing the type-o to my attention! I have three words. Washington State Cherries. There you go. Gorgeous! I was wondering if I could you use frozen cherries in this recipe. I am sure you could use frozen fruit, though the consistency may be different. Fresh fruit is always better, especially plump cherries. Quick way to get the pits out of cherries is by using a plastic straw to puncture through the cherry taking the pit with it.